You save $16.68 on quantity of 6 bulbs over �each� price on this variety. Spicy fragrance, 3 to 4 Feet. Late July flowering. Surpassing even 'Miss Ariel' in our opinion, 'Angela' is the next step in hybridizing evolution. 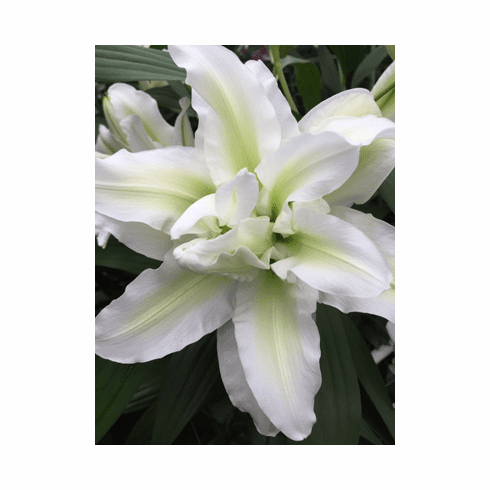 Beautiful, white �frilly� flowers that are free of spots and sport just a bit of rarely found green highlights in the petal centers. Flowers hold up well in our Pacific NW summers, but in hotter, southern areas, some afternoon shade is advised to prevent scorching. As with 'Miss Ariel', cooler temperatures will intensify the green highlights whereas, hot, direct sun will lessen the amount of green you will see. Wonderful sweet fragrance. 3 to 4 Feet. Late July.